"Ready to use", finest metal polishing wadding for flat and uneven metal parts. Luster Pad consists of a cleaned, surgical cotton, similar to products used for cosmetics. The abrasives are pressed into the cotton, under high pressure, already during production and are present in every single fibre. 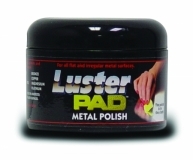 Therefore Luster Pad is very efficient and unbeatably fast in use. Since the polishing residues are just taken of with a clean cotton or Luster Lace microfibre cloth, stressy repolishing works are absolete. Luster Lace COMBO, 9 different laces. For all round and tubular metal parts. 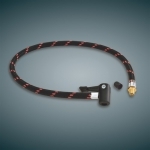 Includes 4 thin ties (for spokes), 3 ties 20 mm width and 2 ties 25 mm width. 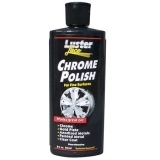 Luster Lace Chrome Polish is the special product to clean and care finest chrome, gold-plated, platinated and anodized parts. 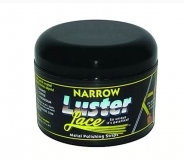 Luster Chrome Polish does not contain any abrasives, is very efficient and creates the typical LusterCare Finish on most sensitive surfaces, known in the custombike scene all over the world. 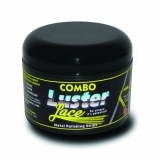 Luster Seal protects and seals your polished metal parts and creates a water- and dirt-repellant effect. The brilliant finish, reached with Luster Lace or Pad, is conserved up to 6 months. Luster Seal was especially developed to be used on Luster Lace or Pad, but it is also ideal on polished or clear-coated rims and metal parts.